"The Alliance has built a foundation of high-quality football, revolutionary technology and world-class partnerships with the NFL, CBS and Turner Sports," said Jones in a statement. "It was only natural that we at the Cowboys organization would want to join that great group of partners. I have always believed that our great game of football could use a league to give players the shot they needed to make it to the NFL, and Bill Polian, Tom Dundon and Charlie Ebersol, have done just that. We are proud to be able to host their inaugural Championship Game." The statement also noted that the San Antonio Commanders, the AAF's Texas-based team, have been leading the league in attendance. "Jerry Jones isn't just a close friend of Tom, Charlie and mine, but he is also a great supporter of our league," said Bill Polian, the AAF's head of football. "To be able to showcase our brand of top-flight football on NFL Draft weekend in the state-of-the-art football facility built by Jerry is a Texas-sized win for our league. Texas has played a huge support role in the launch of The Alliance. Our San Antonio Commanders average nearly 30,000 in attendance for home games, and we are sure football fans in Dallas/Fort Worth will support our Championship." The decision to move the game from Vegas is interesting, to say the least. 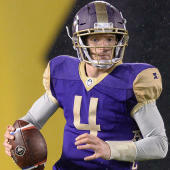 The AAF has been open about is relationship with betting and one of its key investors is MGM Resorts International. Going from Sam Boyd Stadium in Vegas to the Ford Center is a big drop in seating capacity, as well -- three times, in fact, from 36,000 to 12,000. "We are eternally grateful to the people and city of Las Vegas as well as Las Vegas Events and the LVCVA for their early support and confidence in what we have created. Not only is Las Vegas the home of our investor and world-class partner, MGM Resorts International, Vegas is the undisputed mecca for live events," said AAF CEO Charlie Ebersol. "While we won't play our championship game in Vegas this year, we will still be offering a one-of-a-kind experience for Alliance fans in Las Vegas during our Championship weekend."